During 2014/2015 Travelling Ahead carried out an Education Project with funding from Children in Need. Young people designed a questionnaire which was filled in by over 50 young people from around Wales and the worked on report cards on their experiences and views on education. 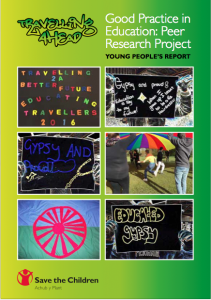 Read the report here Travelling Ahead Young Peoples Education Research report Eng and in Welsh here Travelling Ahead Young Peoples Education Research Report Cym to find out what young people recommended for improving the education experience of young Gypsies, Travellers and Roma. The publication is not the end! Young people are still using the report to speak to education service managers in their local authorities who can make a difference and influence positive change. Following the report of the National Assembly’s Inquiry into Gypsy, Roma and Traveller Education the Welsh Government have agreed the report should be sent out to all schools in Wales. Your Top Tips for Teachers! Young people from around Wales fed in to the development of a tool kit written by Show Racism the Red Card – you can download the tool kit here in Welsh and English.